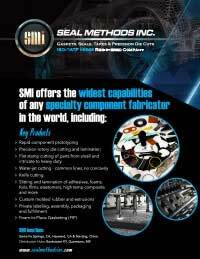 We are the world’s most comprehensive specialty components fabricator. Our diversified manufacturing technologies, including a wide range of tool-less CNC cutting capabilities, give us the edge in aligning the right tools with the right materials for any application, no matter how specialized. With laser, water jet and knife-cutting equipment, Seal Methods has the material knowledge and fabrication skill to create custom components for even the most demanding applications. As one of the first gasket manufacturers to achieve ISO/IATF 16949 certification, we maintain a leadership position as a global supplier. SMI’s tool-less cutting capabilities allow us incorporate a broader range of challenging materials with optimal results. Our cutting-edge equipment allows us to produce short and long run quantities according to our customers’ needs. From prototyping on tool-less cutters to manufacturing higher production quantities cost effectively, our three facilities can meet any request, no matter how specialized. We produce gaskets & seals for a wide variety of different markets, including Aftermarket Automotive, Construction, Electronics, Energy & Electric Vehicles, Heavy Truck & OEM Transportation, Industrial, Medical, and OEM Automotive. CNC cutting at SMI includes knife cutting, laser jet cutting, and waterjet cutting. SMI uses CNC cutting in prototype, one-off, low volume, and high volume production. The precision and range of our cutting technologies yields precision components for every application. SMI’s CNC lasers enable short to medium production runs that require cutting a variety of materials, from pressure sensitive adhesives to foams, sponges, and plastics. Laser cutting offers a tool-less option to cut components without the setup time of other methods. SMI proudly maintains a modern manufacturing facility with the most advanced laser cutting machinery available today. Knife cutting can be used for virtually anything you would cut with a utility knife – but with the speed and precision of a CNC router. From high-temp ceramics to leather, fabrics, and an unlimited variety of foam and sponge, knife cutting provides speed and precision for highly specialized industries such as aerospace, and automotive. SMI’s digital knife cutting equipment delivers both high cutting speeds and craftsman-level precision you can count on every time. Waterjet cutting is a highly effective technique that uses high-pressure, high-velocity water forced through a small nozzle to produce a very clean, precise cut. It is a fast, flexible and accurate method ideal for cutting complex parts and maintaining material integrity. Waterjet technology offers accurate cuts of complex and intricate parts, higher yields, and less compression distortion. It is an excellent method for producing prototype and test parts or short production runs. With decades of experience, 350,000 square feet of capacity, and quality certifications you can rely on, Seal Methods is an industry leader. All of our locations use state-of-the-art equipment, including the option of tool-less CNC cutting fabrication (knife cutting, laser jet cutting, and water jet cutting) or high speed die-cutting for high quality, precision components in the timeframe you require. Our sales engineers guide you through the selection of an almost limitless number of choices to find the one most appropriate – both performance-wise and price-wise – for your application. SMI in-house capabilities mean our experts can specify, design, and manufacture everything on site, ensuring that processes are aligned for the optimal functionality of their seal and gasket application, as well as cost savings and exceptional quality control. Request a quote online or call 800-423-4777 to learn more.